Signed on Dec. 21, 2018. He was selected in the sixth round (50th overall) of the 2018 CFL draft and originally signed on May 14, 2018. (Calgary) Simon attended Calgary’s training camp before returning to university. In two pre-season games for the Stamps, he had two carries for one yard and one catch for three yards. Simon played five seasons at Regina and is the Rams’ all-time leading rusher with 3,295 yards. 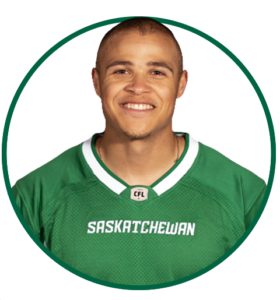 He was a Canada West all-star in 2017 as he finished the season with 914 rushing yards and three touchdowns while also catching 27 passes for 293 yards and three majors. In 2018, he averaged 6.4 yards per carry with 352 yards on 55 rushing attempts. Simon had 31 combined rushing and receiving touchdowns during his career with the Rams. Simon also competed in track for Regina. He played his high-school football at Thom Collegiate in Regina.